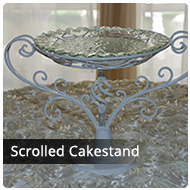 Haz offers a wide selection of cake stands to enhance your special event. 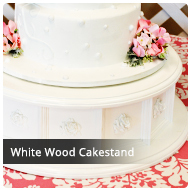 Custom floral decor available to accompany and match your cake. 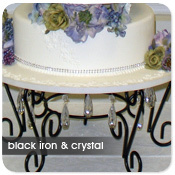 Renaissance black iron cake stand measures 16″ in diameter. 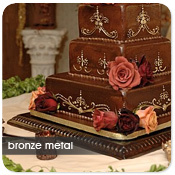 Uses a 20″ base board for cake display. 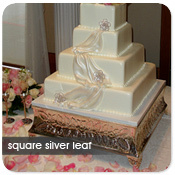 Silver -plated with silver leaf accents. 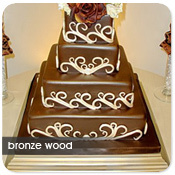 Measures 19″ in diameter. 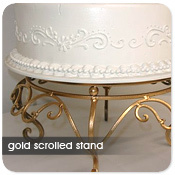 Gold Scrolled cake stand measures 14″ round. 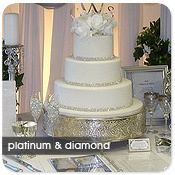 Silver -plated w/silver leaf accents. Measures 22″ square. 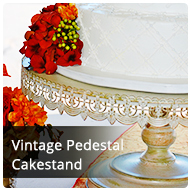 Vintage round pedestal cake stand.